It’s no secret that running a business takes a lot of effort, but there are tricks to make some parts a little easier, and I’m going to talk a little about the software and apps that we use to make our day-to-day work more efficient. Another application we use is Asana. This is more straightforward. It’s an application that helps you stay organized through a task management system and calendar. The reason we use Asana so much is because it allows you to have team calendars so you can see what you and your team have planned! You can set yourself or someone on your team due dates for tasks and they will get notified when it is due. 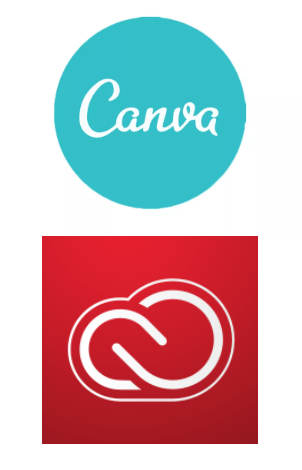 Some of the more creative tools we are are Canva and Adobe Creative Cloud. Canva is often useful when we are making any graphics, such as tasks like adding text and glamming up pictures. We like that it is very easy to use and has lots of variety to change up pictures such as different stickers you can add. Adobe Creative Cloud is what we use while editing pictures, videos, and even web design. We find it to be very useful for many of our projects. Still, we understand it is difficult to run a business even with all this extra support. That is why we see a market for digital marketing and aim to take some of the load off entrepreneurs! Check out our different marketing packages here.